The choice of Rotork Type K vane type actuators to replace existing equipment has enabled the control upgrade of a cargo ship’s main propulsion intake dampers to be completed in three days. SS Cape Isabel is a 655ft, 15,000 ton roll on/roll off cargo ship based at Long Beach and operated by the US Military Sealift Command. Launched in 1976, the ship is powered by two steam turbines. 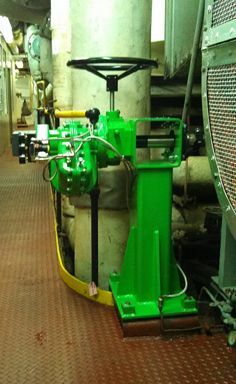 The ship’s two turbine intake radial vane dampers were equipped with pneumatic controllers which had become obsolete. The old actuators did not respond quickly and accurately to signals from the control system, resulting in potentially inefficient combustion and undesirable emissions. Replacing the actuators was necessary to increase efficiency, reduce maintenance and the associated costs that could result from unplanned shutdowns. The equipment selected to upgrade the old actuators was Rotork Type K damper drives, which provide a direct ‘drop-in-place’ replacement that exactly matches the existing damper drive footprint and output shaft location. Duplication of the existing drive’s dimensions simplifies the installation, enabling the upgrade to be swiftly completed in a matter of hours. Type K damper drives incorporate vane type actuators that offer high speed full stroke capabilities of less than 5 seconds, combined with accurate and responsive positioning. The rugged construction is designed to withstand the harsh environments associated with power stations and combustion plants. Once the two Type K pedestal mounted damper drive units had been delivered to the ship, installation of both units was performed by engineers from Rotork Site Services within three days. All the work was co-ordinated prior to commencement by the ship’s Chief and First Engineers. Days one and two were taken up with the removal of the old equipment and the installation of new, enabling commissioning, testing and hand-over to be completed during day three.